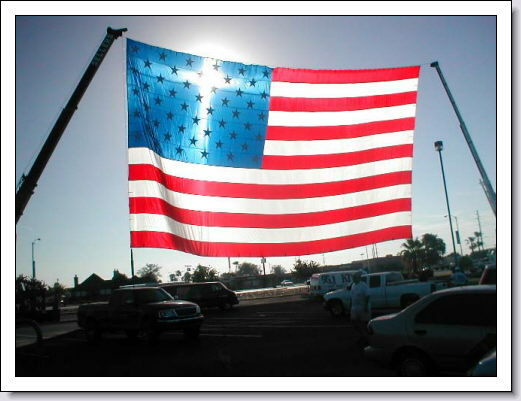 The flag is said to have been hung between two cranes in the parking lot of Fry's grocery store in Yuma on September 2, 2001, the day after the Attack on America. According to the folks at the Yuma Elks Lodge the flag is 60 feet tall and 120 feet wide. The picture was taken by Janna Noe who snapped the photo with her digital camera and noticed the cross when she later looked at the pictures. When light shines through translucent fabric, there is frequently a distribution of the light along the pattern of the weave of the fabric. 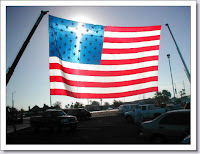 This particular picture appears to have been taken when the sun was toward the upper portion of the blue section of the flag so the upper portion of the vertical line is shorter than the lower portion, resulting in a traditional looking cross. If the sun had been in the middle of the blue portion of the flag, the lines would have been more equal in each direction. HAPPY 4th ... may it be safe & enjoyable for you!